Thanksgiving is all about friends, family, elastic waist pants and carbs, lots and lots of carbs! So when my friend Bre asked me to join 25 other creative friends for the mother of all Thanksgiving tablescapes tours, I was happier than the pardoned White House turkey. I’ve shared my full fall home tour here but now it’s time to pull up a chair and pass the biscuits (full source list at end of post). Think outside the bouquet when setting a table. 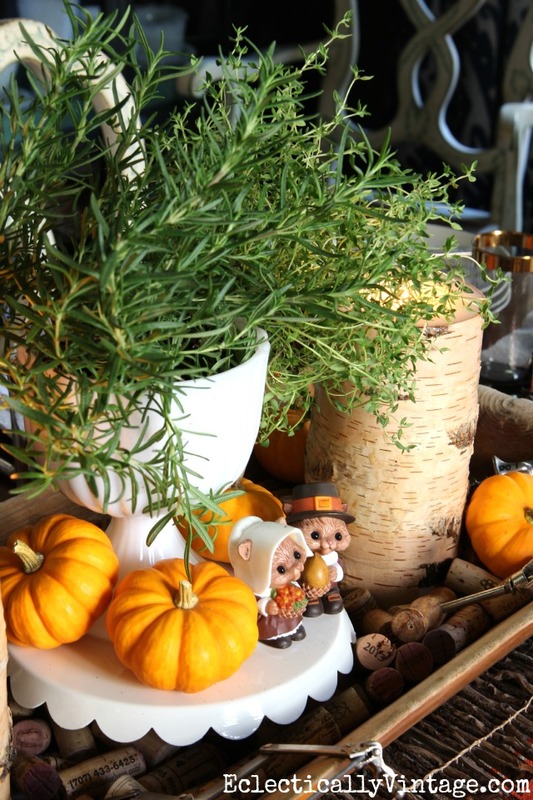 A vintage dough bowl is filled with corks (buy corks complete with wine stains at a great price here), birch bark candles, vintage corkscrews and rosemary and thyme from the supermarket. Mini pumpkins add color. Do you prefer light or dark meat? 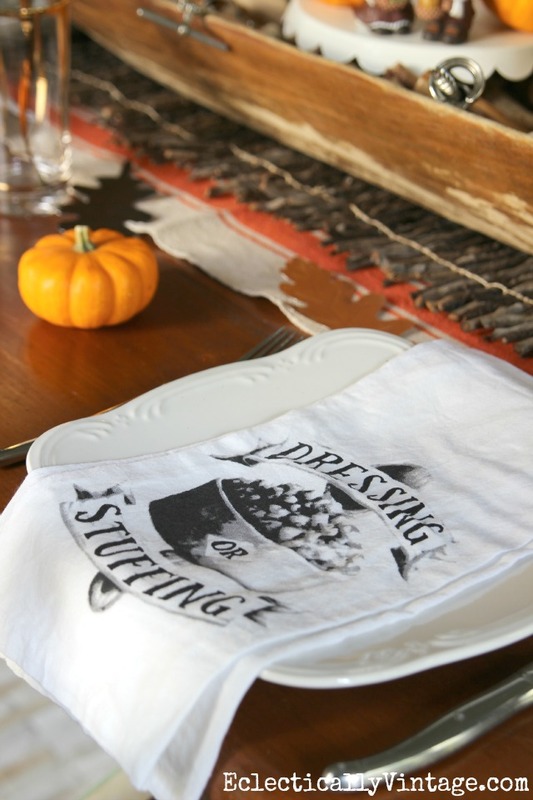 Love this set of three Thanksgiving dish towels turned napkins that will have guests discussing the age old debate of light or dark, dressing or stuffing, whole or jellied cranberries! 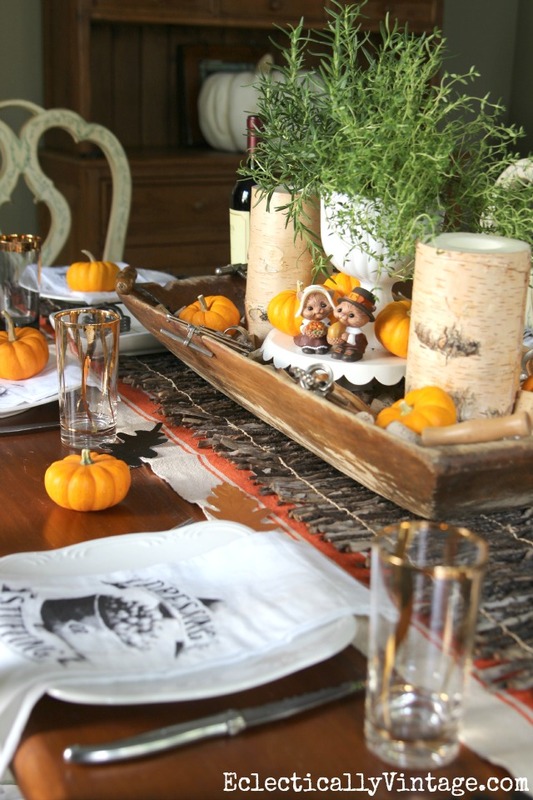 It’s all about layering and texture and the orange striped table runner sets off the rustic twig runner on top. 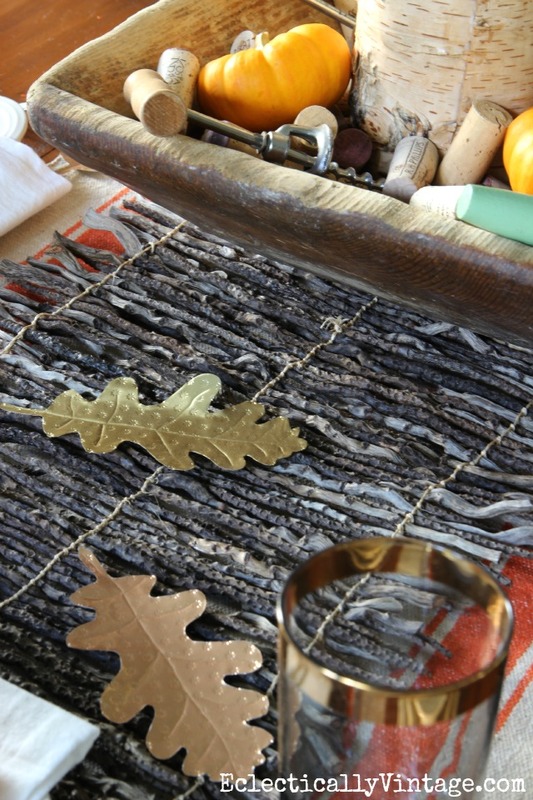 See how I made these embossed metal leaves to scatter across the table for some bling. 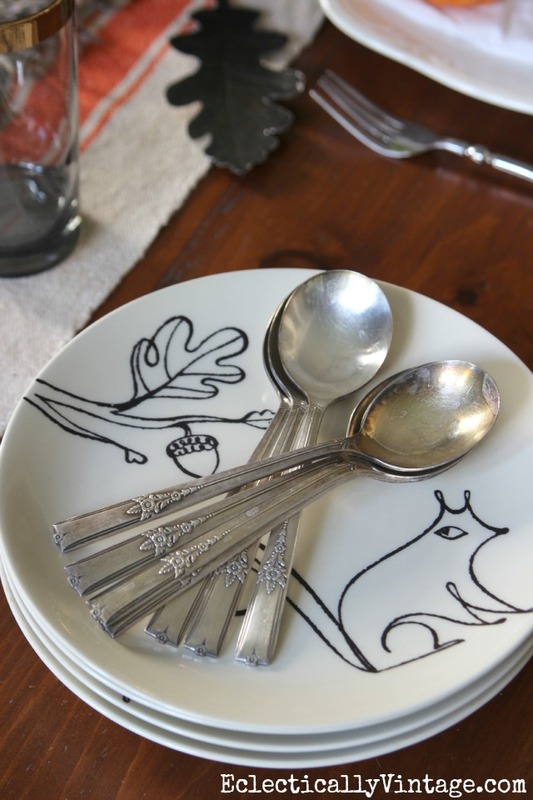 I’m nuts about my squirrel plates but I’m coveting these wishbone plates and they’re on sale! Back in the day when I was a big haired college girl, I scooped up these salt and pepper shakers when I worked at a Hallmark store. Wine anyone? 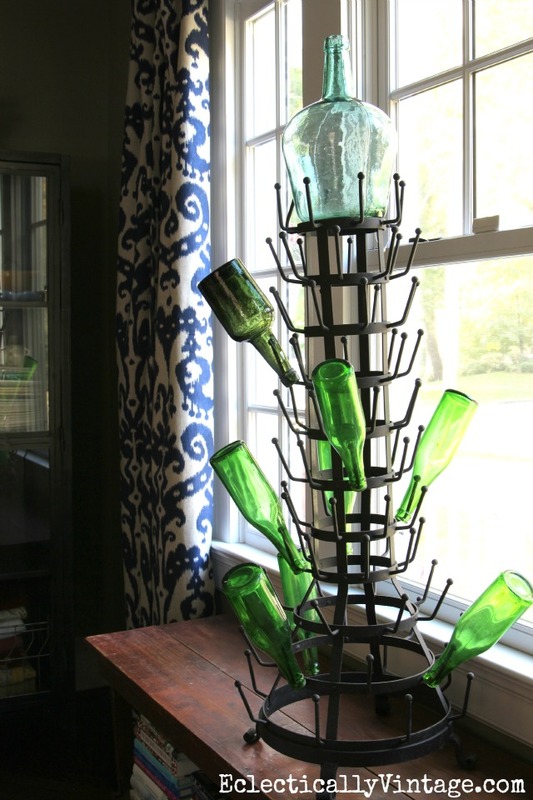 Today, my huge bottle drying rack (see a smaller one HERE at an amazing price) holds bottles but it would be perfect for holding Christmas ornaments, mugs and anything else I can dream up. P.S. Let’s end this debate once and for all. P.P.P.S. 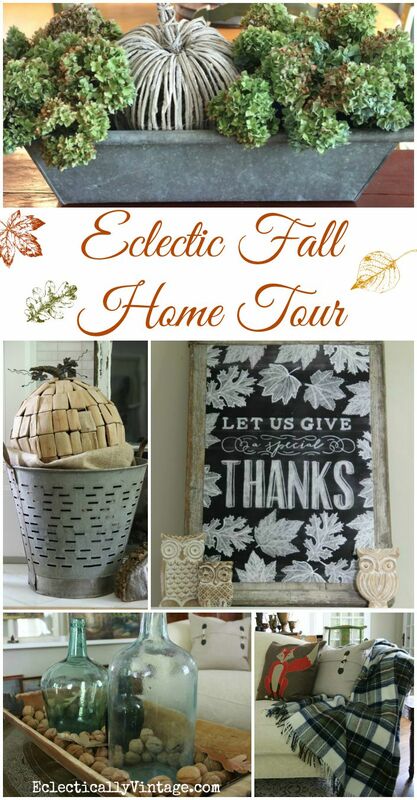 Make sure to check out my Fall Home Tour. 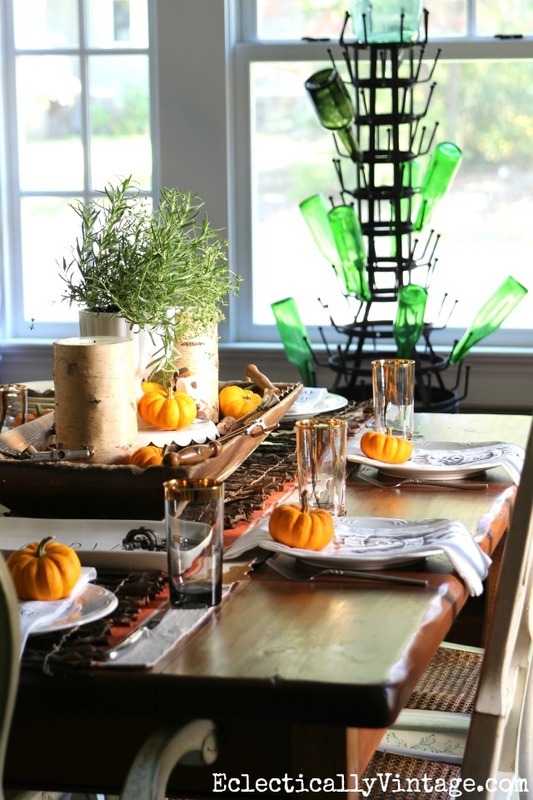 Check out all the tablescapes today and stay tuned throughout the week for more. looks awesome, kelly! i love the natural elements and the mice are a fun touch! and where did you get all those corks? Can you believe it took me two whole days to consume enough wine!? Love it all! Great job, Kelly!! Thanks Kennesha – happy Thanksgiving! Thanks Bre – you’re welcome at my table any time! 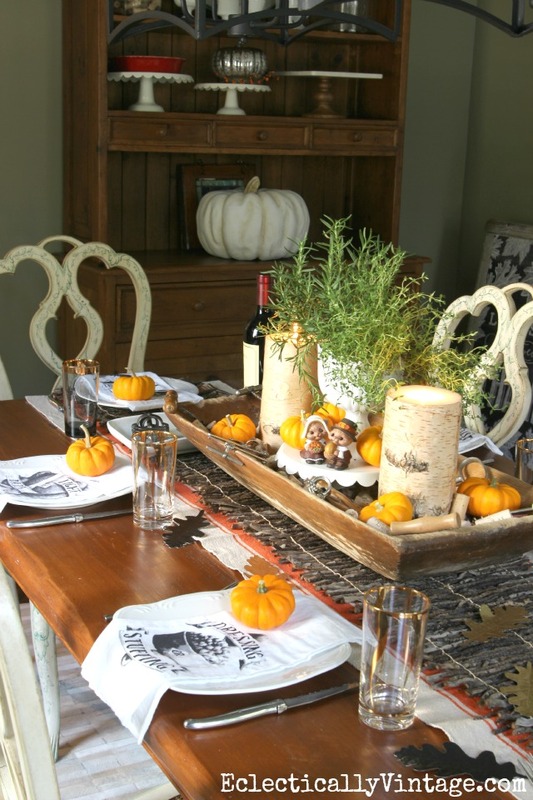 Beautiful table Kelly!….Looking forward to all the inspiration in this tour! Your table is so very wonderful,you’ve done an excellent job,i might even lose weight at this table i’d be looking instead of eating,lol!! The mice are cute!! Maybe I need to stare more and eat less Marlene! Unfortunately, those elastic waist pants are no laughing matter! Agree! Thanks Jen – now let’s eat! 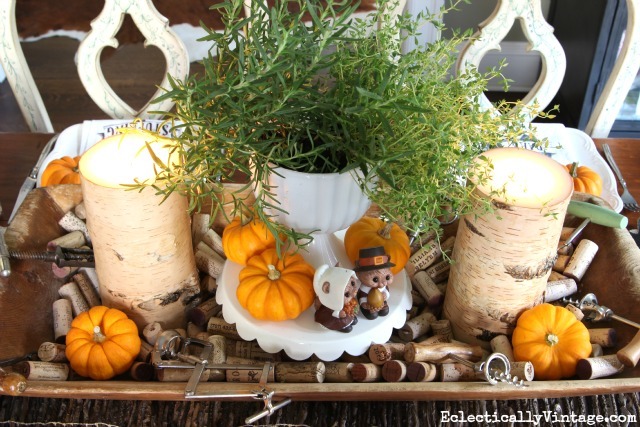 Such a charming table setting and those little salt and pepper shakers are so cute! Such a beautiful job Kelly! 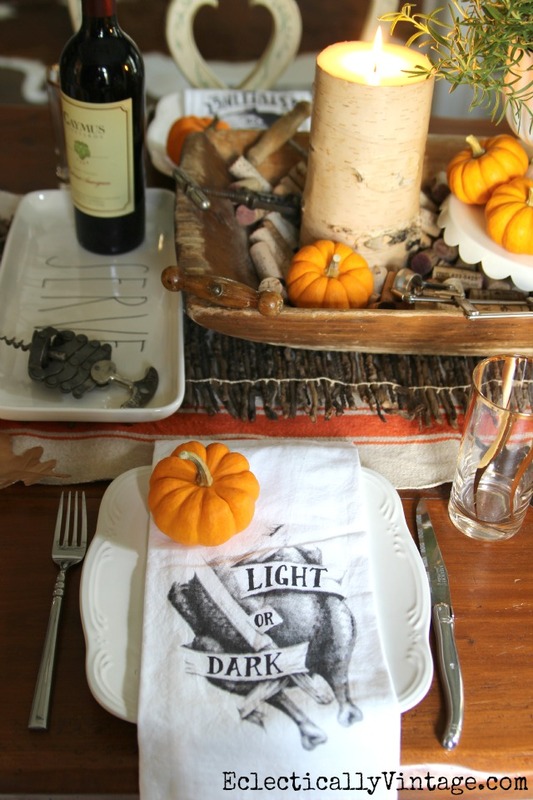 I love the napkins! Kelly, It looks awesome! I love everything! The plates are super cool too. I’m so glad you didn’t jump right from Halloween to Christmas! We definitely need to include Thanksgiving which sometimes seems to get lost these days.